Stock photography is nothing new to the internet, and there are plenty of royalty-free and copyright-free alternatives worth looking into if the aforementioned sites don’t pan out for you. Most of them offer high-quality images with a few stipulations — such as attribution or restrictions on non-commercial use — but some do offer public domain images. Below are few websites of note. 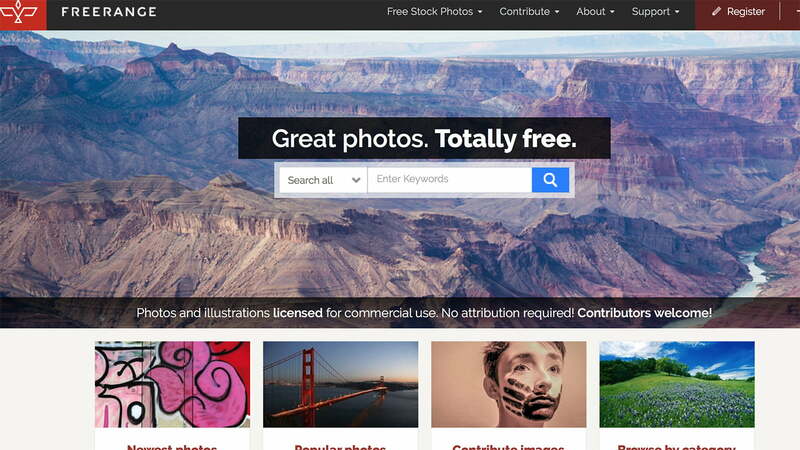 Freestock features a diverse selection of images, logos, and videos that are free to download. The site often requires you to link back if you plan on using content on a website, but otherwise, places no restrictions on you. Videos of waving flags and glittering water are prime examples of the kind of stuff you might not find elsewhere, and the site has a neat “keyword” feature, which makes it relatively easy to browse similar photos. As one of the first to enter the stock photo scene, Morguefile has been around since the late 1990s. Although the images are not in the public domain and you cannot claim ownership of them, they are still free to use in creative projects. Whether you search or browse the links, be sure to click on the Morguefile on the left — the others in the navigation bar lead to paid stock photo websites. You have to register for a free membership in order to download images using Freerange, but it’s quick and gives you access to a vast archive of quality images that can be used for both personal and commercial use. You’ll see some advertising, but it’s for a good cause; the photographers get paid when users click on the ads next to their submissions. 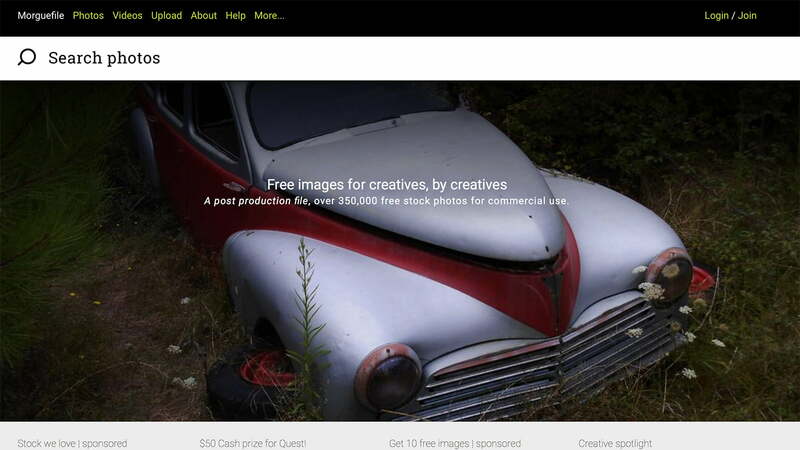 Touting more than 128,000 free images, StockVault is great for photographers, designers, and students looking to share their work for both personal and non-commercial use. The site has a clean design and simple navigation, but search results often include images from both StockVault and Shutterstock (which requires a fee). Regardless, the site offers an admirable collection of images, no matter the topic. Getty Images acquired Stock.xchng and renamed it Free Images, bolstering traffic and making the site more popular than ever before. You need to sign up for a free account before you can download anything, but there are around 400,000 images to choose from once you’re up and running. Some are free to use, while others require notifying the artist or abiding by a standard set of outlined restrictions. As another free site maintained exclusively by its users, Public Domain Pictures hosts a hodgepodge of images that users can download at any time; you can also upload images to contribute to the library. Clicking on a photo will provide you with detailed information about the camera used, the artist, license, and several other technical features. If you’re feeling generous, you can also pay for premium downloads or choose to buy the artist a cup of joe – which basically deposits money in the artist’s account via PayPal. Free Digital Photos offers both premium and free versions of its images for personal or commercial use. Nearly every image is available as a free download, but there’s a fee if you decide to ramp up the resolution and overall image quality. The site offers a nice selection of categories, from travel to architecture, and an option to filter search results by photos, illustrations, or a specified image ID if you already know what you’re looking for. Like the title implies, Textures.com (formerly CG Textures) offers mainly textures. 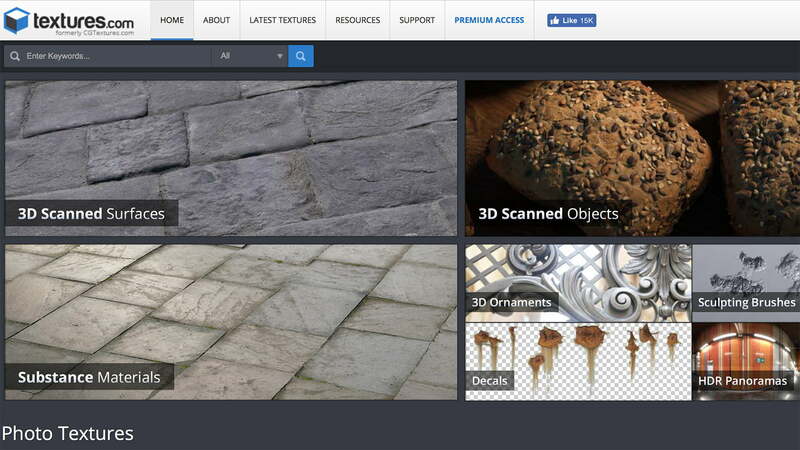 Made by a graphic designer for graphic designers, this site makes creating textures super easy and fun. Everything featured on the site is free, but it does require you to sign up for a membership to access the entire photo collection. The site also provides an assortment of traditional photos, such as animals and skulls, if you don’t mind taking the time to browse for them. It even houses a neat gallery that showcases how people have successfully used the textures in the past. It’s a great way to spur some ideas for a potential project, or to be horrified by what people are capable of making. 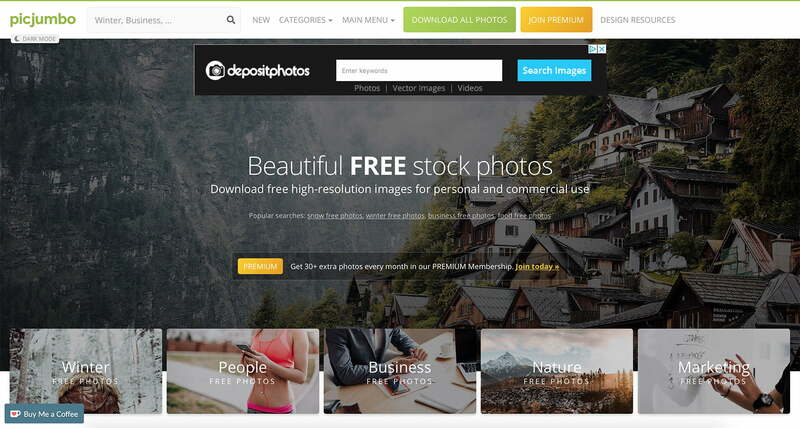 Built by a photographer and graphic designer, PicJumbo caters to users who are looking for premium, stylized images that are free for commercial use. Unlike many stock photo sites, PicJumbo’s images often have a clean and fresh look that’s appealing to many lifestyle and photography enthusiasts’ aesthetic. PicJumbo is also neatly organized into “collections” that can be downloaded as individual downloads, or as a package by upgrading to a premium subscription. PicJumbo even has a Photoshop plugin, one that allows you to search the site’s image library without even opening your browser. Entering the photography game for the first time? Lucky for you, we’ve put together a guide on how to create a watermark, as well as a roundup of the best tripods.